Mayor Michael Bloomberg celebrates on stage after a narrow win over Democratic challenger William Thompson last November. When Thomas Jefferson campaigned for the Bill of Rights, he didn’t exempt New York mayors from the fundamental principle of freedom of the press. The idea was so important to Jefferson and others among our founding fathers that it was embodied in the First Amendment. That’s why the attitude of Mayor Bloomberg, who professes to believe in transparent government, seems strange. After Manhattan District Attorney Cyrus Vance Jr. announced that a close associate of the Mayor, John F. Haggerty Jr., had been indicted for stealing 1.1 million dollars from Bloomberg during the 2009 campaign, the Mayor bristled at reporters for pursuing the matter. 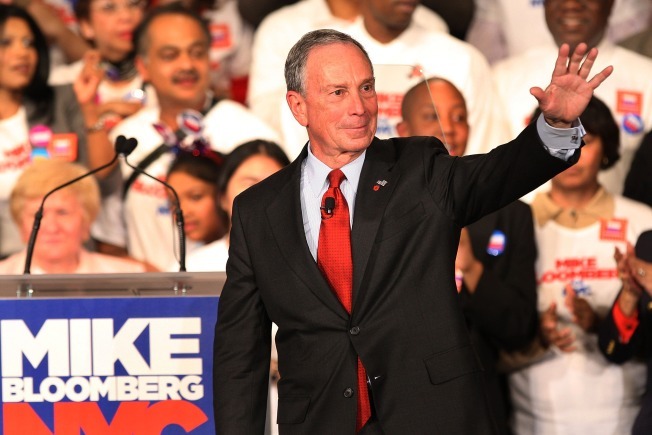 Bloomberg was asked about his contributions to the Independence Party, which allegedly funneled Bloomberg’s money to a company Haggerty established, the Special Election Operations L.L.C., to provide security on Election Day. Much of the 1.1 million dollars, the DA said, went into Haggerty’s pocket. Allegedly, Haggerty bought a house in Forest Hill Gardens, for $600,000. About $450,000 went to the Independence Party. Only $32,000 was used to provide security at the polls. Haggerty pleaded not guilty to the charges. Vance said he had found “no criminal misconduct” on the part of the Mayor or his campaign. Another reporter wanted to know how the case had affected him personally, in view of his close relationship with Haggerty. “Miss, I just said,“ the mayor interjected. The sad thing is that Bloomberg sees himself as the arbiter, the judge, to decide what questions are legitimate and illegitimate. That’s not what Jefferson and Madison had in mind. Lenora Fulani, a party leader, once said Jews “function as mass murderers of people of color.” She was ousted from the party’s executive committee -- but the words can’t be erased. The main function of the Independence Party seems to be to give politicians of the major parties an option to run on another line if it makes a voter more comfortable. But the Independence Party is neither independent nor free from suspicion that it is not what it pretends to be. Our mayor, the richest man in New York, in the heat of an election campaign, gave more than a million dollars to Haggerty. Clearly, he doesn’t discriminate against any individual or group that promises to help him. The fact that he gave the Haggerty company $1.1 million is not too significant to him. It’s chump change. I asked Blair Horner of State NYPIRG, a reform group, about the matter. “I wonder why he gave the money in a personal check, rather than as a contribution from his campaign. It would appear that the mayor was the fall guy here. If the charges prove true, Bloomberg was so hungry for victory that neither he nor his other advisers were able to spot the fraud. That he opened up on reporters trying to do their job is understandable. He just doesn’t look good.